Serving, protecting and providing for others demands a smart device you can rely on. 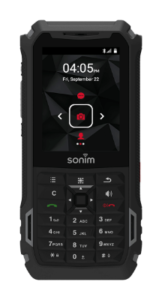 Sonim XP8 is the ultra-reliable, ultra-rugged smartphone that’s built to provide those who serve with the smart communication they need, regardless of situation or environment. Sonim XP8 is more than just another rugged smartphone. It’s where tough meets smart, agility meets security, cost meets value. This Band 14/FirstNet enabled smartphone is for missions that demand much more than voice communication. Industry-leading Rugged Performance Standards, Military 810G, waterproof and Non-Incendive Class I, II, III, Div 2 ratings ensure you work and thrive even in the most extreme environments. Sonim sets the bar for how ultra-rugged mobile devices should perform. And we back it up with a 3-year warranty. Note: Please check with your service provider for availability. 1 CDMA/EVDO available for certain carriers only. 2 Please check with your service provider for availability. 3 Language avalability based on region. When communication failure is not an option, Sonim XP5s is the answer. Ultra-rugged and purpose built, it thrives in severe conditions, offering those who serve an ultra-reliable Push-To-Talk solution. As more enterprises rely on Android devices to work in more places, maintaining the highest levels of durability are key. 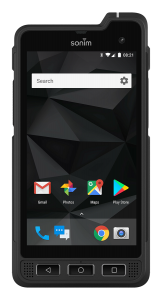 That’s why we’re proud to announce the ultra rugged XP8 has been validated by Google for their Android Enterprise Recommended program for rugged devices. Sonim is ready to serve. Are you ready for ultra-rugged?